CARACAS, Venezuela (AP) — Venezuelan opposition leader Juan Guaido's top aide was taken away in the middle of the night by masked intelligence agents who broke down his door early Thursday, drawing condemnation from the United States and other countries pushing to oust President Nicolas Maduro. Washington demanded the immediate release of Guaido chief of staff Roberto Marrero, whose whereabouts after the raid on his Caracas home were not immediately disclosed. Marrero was detained as part of an operation against a "terrorist" cell, Interior Minister Nestor Luis Reverol said. Weapons were confiscated from Marrero and a bodyguard was also arrested, according to Reverol. Guaido's top aide is being investigated for crimes including an alleged plot to kill Maduro, the chief prosecutor's office said. Maduro indicated there could be more arrests, saying on national television that his government is dismantling a broader "terrorist" network. The arrest represented a sharp increase in police pressure on the opposition after a period of relative calm. 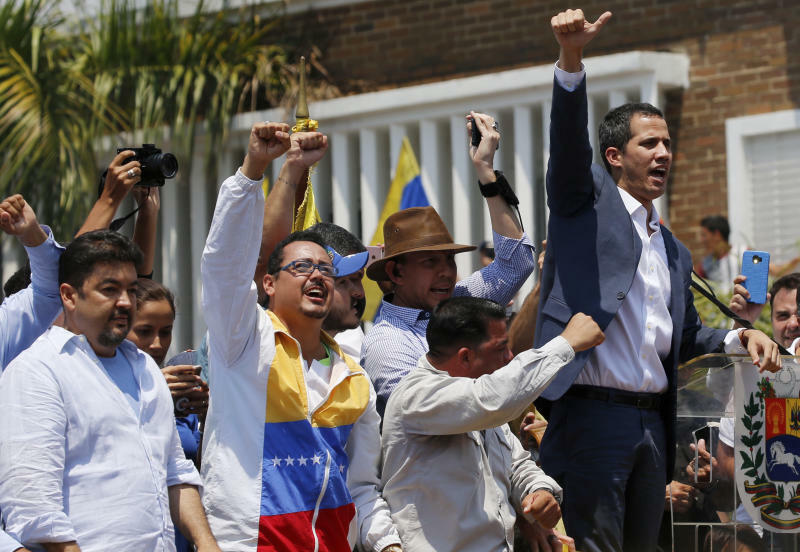 Guaido, however, characterized the operation as a sign that Maduro is losing his grip on power in a country suffering from years of economic hardship and political polarization. 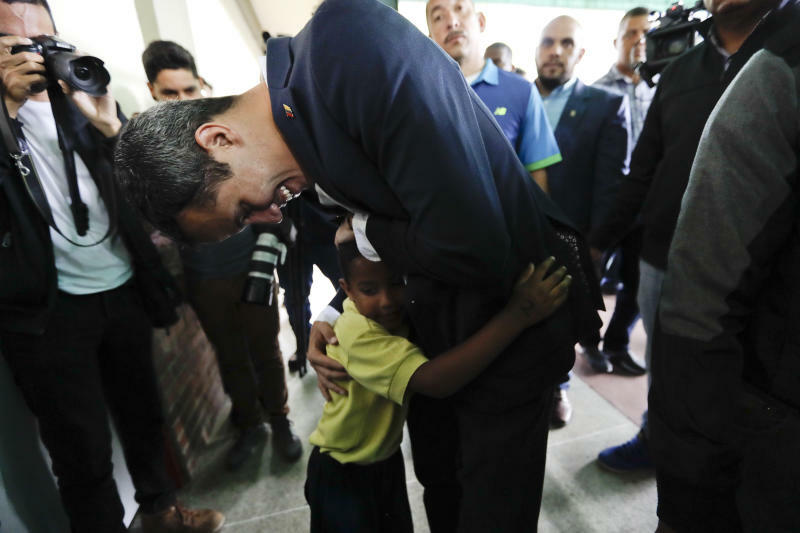 "Either he doesn't dare to jail me, or he's not in charge," Guaido, the leader of the opposition-controlled National Assembly, said during an appearance at a school. He also said some Venezuelan intelligence chiefs called him to say they weren't involved, in what would suggest a split in their ranks. The United Nations expressed "concern" about Marrero's detention and renewed a call for all parties "to lower tensions and refrain from any action that could lead to further escalation," while U.S. Secretary of State Mike Pompeo tweeted: "We will hold accountable those involved." Guaido contends that he is the rightful leader of Venezuela and that Maduro's re-election last year was illegitimate because major opposition figures were not allowed to run. The U.S. and about 50 other countries have sided with Guaido, and Washington has imposed sanctions to try to push Maduro from power, but the international pressure has not succeeded. The U.S. had warned the Maduro government not to act against Guaido. In Washington, President Donald Trump's special envoy for Venezuela, Elliott Abrams, said he believes Maduro's government is concerned about the international reaction if it tried to arrest Guaido and instead may be targeting Guaido's aides. He repeated Trump's statement that "all options are on the table," but said "we're not thinking" about a military option at this time. Maduro and his ally Russia have said they are concerned that the U.S. could be planning military intervention in Venezuela. The Lima Group, an association of about a dozen Latin American countries and Canada, also condemned Marrero's detention. Marrero reported the raid in a telephone call that was recorded and circulated on social media. As he described how a large number of intelligence officials were entering his home, heavy thuds could be heard. The security forces broke through a screen door and a wooden door to get inside the house and left drawers open during their search, said Carlos Berrizbeitia, an opposition lawmaker who later visited the home. Dozens of security officers were involved. The neighboring home of another opposition lawmaker, Sergio Vergara, was also searched. Vergara said that he was woken up by heavy banging at his door and that agents pointed weapons at him. 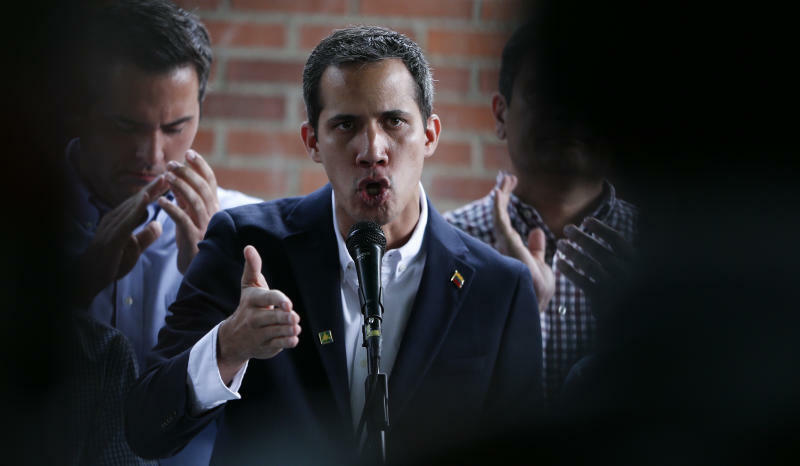 Venezuelan prosecutors say Guaido is under investigation for alleged links to violence as well as the nation's severe power outages. Maduro alleges the blackouts were caused by U.S.-directed sabotage, while American officials and the Venezuelan opposition blame mismanagement and corruption. Associated Press journalist Luis Alonso in Washington contributed.